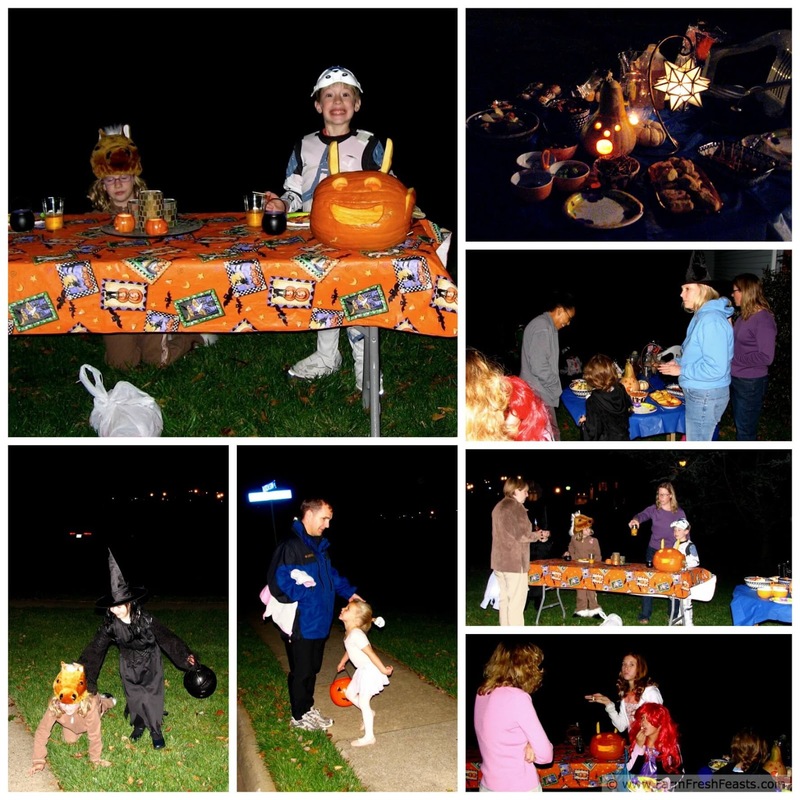 Want ideas for healthy real food Halloween treats? I've got some! Let's start with Spooky Rambutan Eyeballs, with fresh grapes and juicy rambutan in a freaky display. Disclosure--I received a box of #FreakyFruits from Melissa's Produce without obligation. 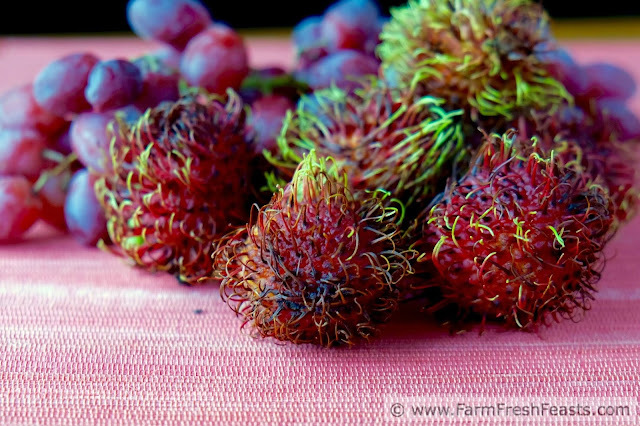 The rambutan used in today's recipe is from that box. I bought the grapes at my local grocery store. My kids were always ready to head out trick or treating approximately 17.5 minutes after returning home from school. Unfortunately for them Beggar Night hours didn't start until suppertime. That was my problem--how do I feed my kids something nutritious when their minds are focused on CANDY CANDY CANDY? During the elementary school years we were fortunate to live in people-dense communities both on and off base. Since my kids could walk/roll around the neighborhood to meet their trick-or-treating needs I decided to host a pre-game Halloween tailgate party and invite our neighbors. Everyone could show off costumes while it was still light, we'd eat a bit of veggies, fruits, and protein to fuel the evening's adventures, and the parents could stand around drinking red wine in portable cups. Find this recipe at Cookistry. Nowadays I still like the tradition of eating something festive yet . . . healthy/natural/less-processed/real/clean . . . you insert the adjective of your choice. To that end, I've got a guest post over on Cookistry where I'm sharing my Buddha's Hand Citron Feta Dip. It's savory and tangy, great for dipping crackers and vegetables and can be presented as scary or as spooky as you like. Please check out the recipe here. 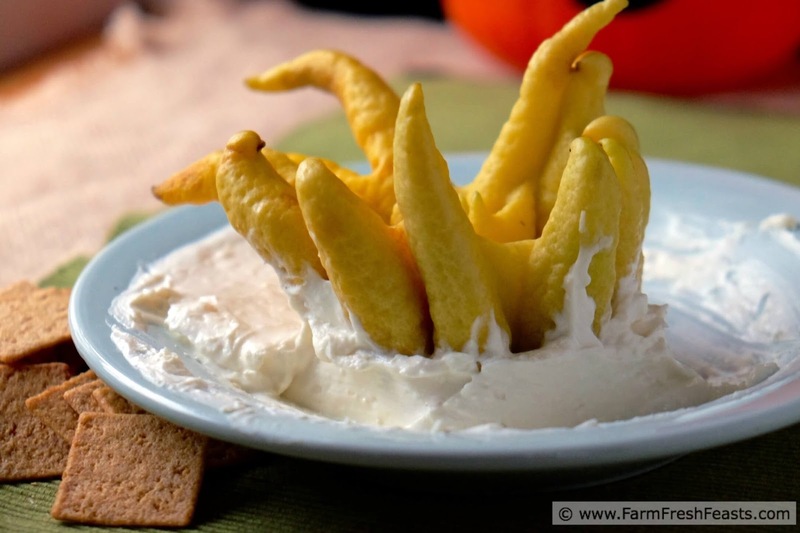 You'll find a bunch more ideas for Halloween snacks as well--sweet and savory, spooky and scary, kid and grownup alike! I really don't care to scroll through plenty of photos and text that ends with a link to someone else's guest post, though, so I've got some value added today instead of just directing you to Donna's blog. Today's recipe is such a simple one I didn't think it merited an entire post, so I'm glad to offer you some options for other healthy Halloween ideas. Sometimes keeping it simple is just the thing. 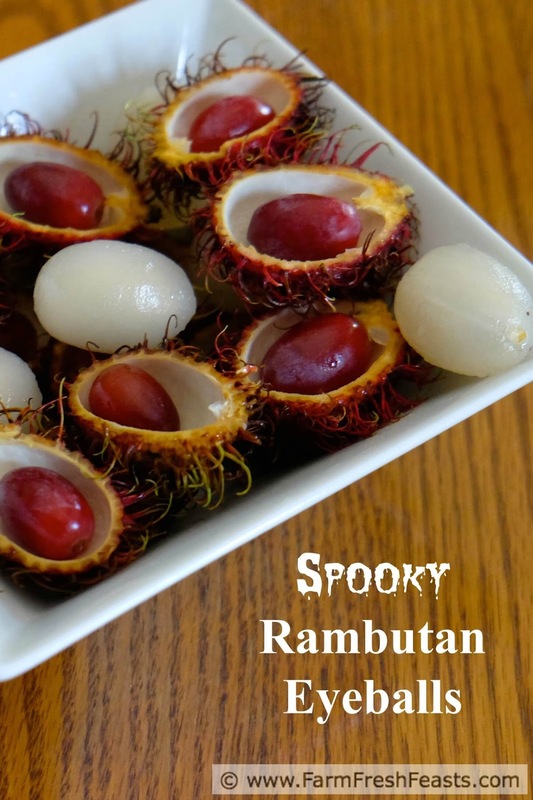 I figured these Rambutan Eyeballs would be an excellent addition to a Halloween spread. I've seen rambutan at the grocery store, and you can check out Melissa's Produce as well. 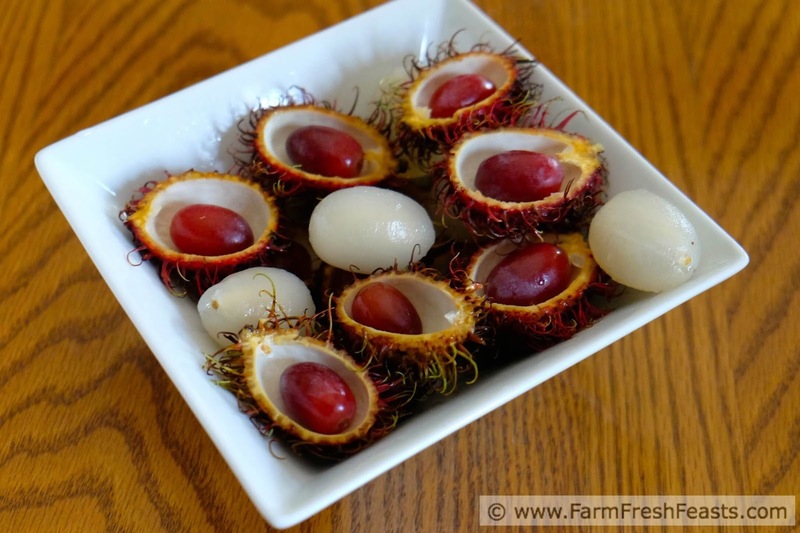 Rambutan taste mildly sweet. They have a pit inside of them, so we found it easier to nibble around and discard the pit, though you could easily slice into the fruit and slice it from the pit. 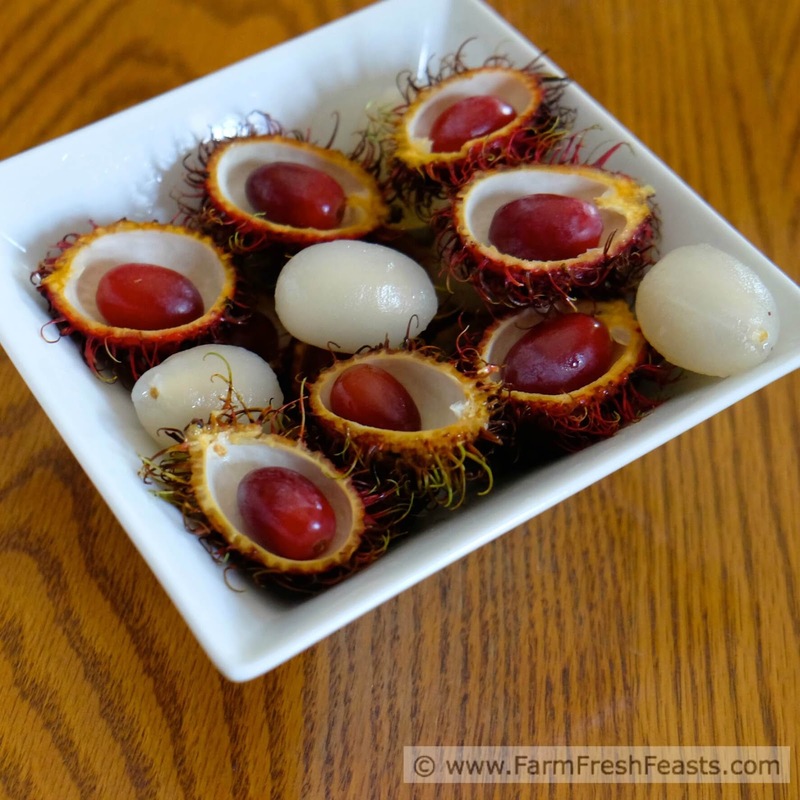 Slice rambutan in half long ways. Place a grape into each open rambutan shell. For more recipes using freaky fruits, please see my FreakyFruits Recipe Collection. For more recipes using grapes, please see my Recipes using Grapes Collection. These are part of the Visual Recipe Index by Ingredient, a resource for folks like me eating from boxes of exotic produce that shows up in the mail. It's almost too easy to bother sharing, you know! But I went there anyway.